blocking in shape for painting to create under-painting then assigning value and color composition, and refining detail for the final concept painting. Demonstrating how to quickly create an efficient concept design from concept idea into visual. How to put rough idea onto the paper sketch. This image is basically inspired by Macross big ship. 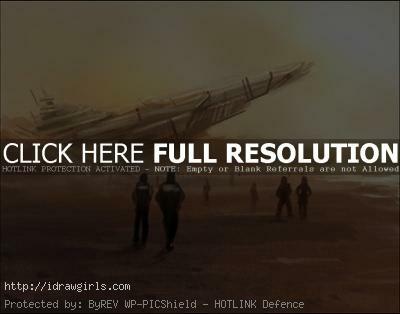 Watch video tutorial how to paint spaceship. I only have part two of the video, I lost part one somewhere in my hard drive. 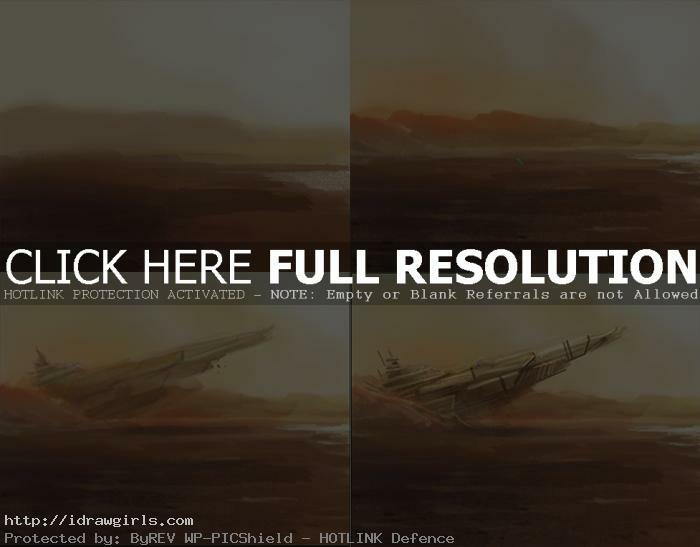 Below are step by step images painting space ship. First, lay down the base color. Step two, I begin blocking in shape for painting. Step three, I then refined these established shape further more to create focal aren of the image and arrange the composition. Step four, I assigned basic value and color composition. Adding micro detail. Then in final image, I was creating scale by using human figures, depth of field using figure and refining the lighting and overall value. Then from here you have the image that you can possibly take it as far as you can in term of pushing detail and realistic if you maintain the idea of the value, composition and color.